Hey Friends! Weird topics today here on TWK. I think i’ll just jump on in! So I suppose technically I have been an “adult” for five years.. But this last month I have felt more like an adult than ever before. As oxy moron as it is, I’ve also been trying to sneak in my favorite child hood stuff as much as I can. Older adults, is this normal? … please tell me it’s normal. This week I was doing some routine blog work like posting on pinterest, editing photos and commenting on insta, etc etc… and I had Frankie Muniz and Amanda Byne’s “Big Fat Liar” circa 2002 on the T.V. Then, later that week I moved my mattress into the living room and almost made a fort but reminded myself that I should probably tone it down and move back into adult land. After that I vacuumed my apartment and felt semi-normal again. After graduation life is SO strange. I also had pizza for breakfast… twice. I understand that this is even more anti-adulting but just WAIT! These super interesting, mega life saving Flatout Flatbreads fell into my life this week and they are wonderful. I’m all about an easy and fast breakfast that tastes delicious! Also, I like pizza any time of day so this really works, who’s with me? 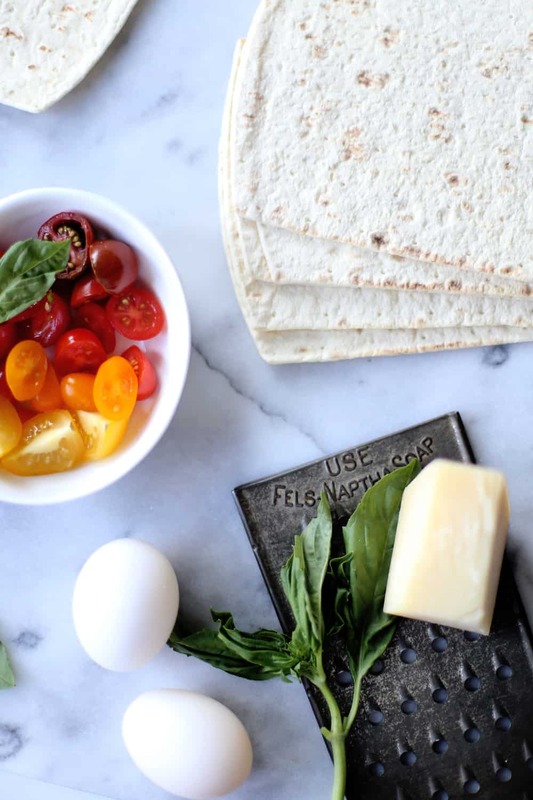 Those of you who are always on the run, this is a better-than- fast-food easy recipe. I understand that the new breakfast menu from taco bell may be tempting but these breakfast pizzas are fresh, fast and efficient! 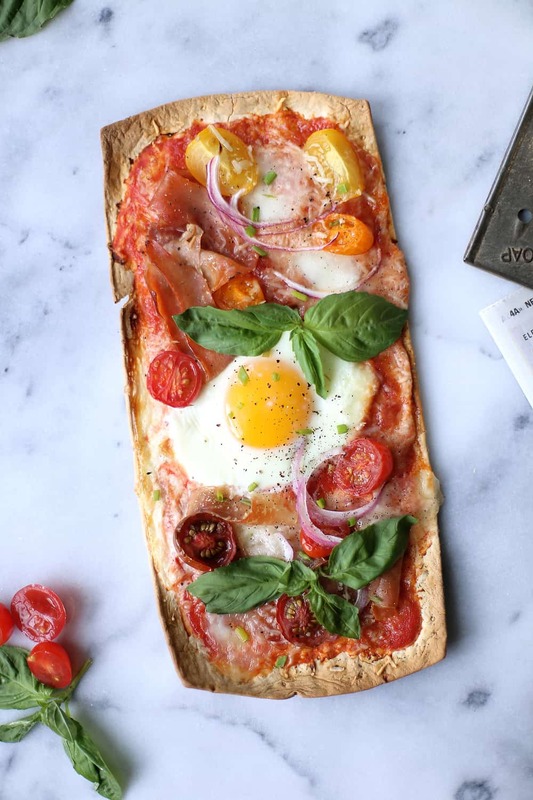 I piled my pizza up with tomato sauce, parmesan cheese, prosciutto slices, an egg and fresh veggies. 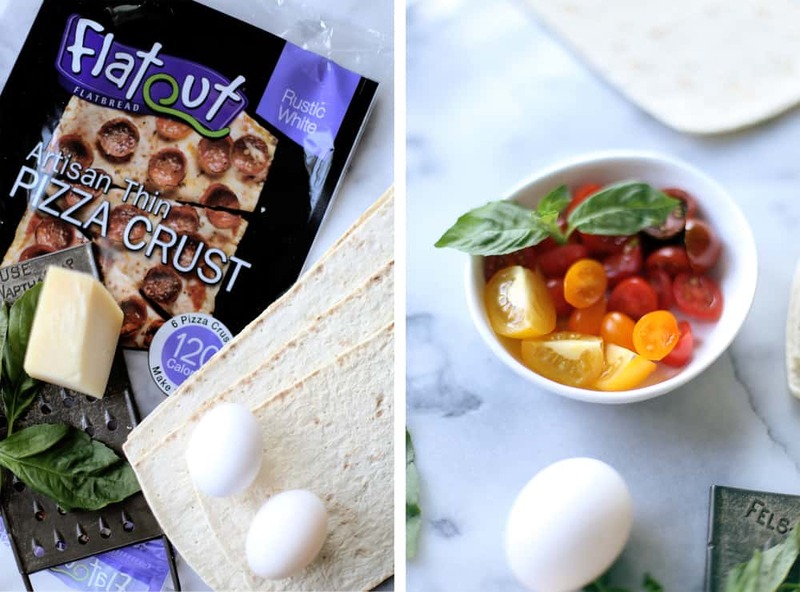 These flatbreads crisp up just like pizzas and at 120 calories you certainly aren’t sacrificing any flavor! They DO NOT have that hard cardboard taste but are super light and fluffy. Give em a try! 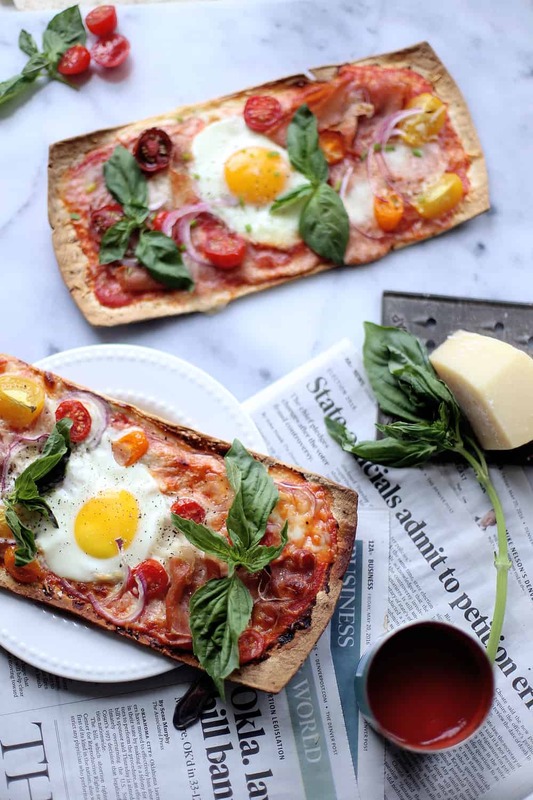 My B-Fast pizza is ready, coffee is getting cold … and Boy Meet’s World is on. Ciao! Preheat oven to 375 Degrees Fahrenheit and bake pizza crust on a baking sheet for 2 minutes. Remove from oven and spread pizza sauce evenly. 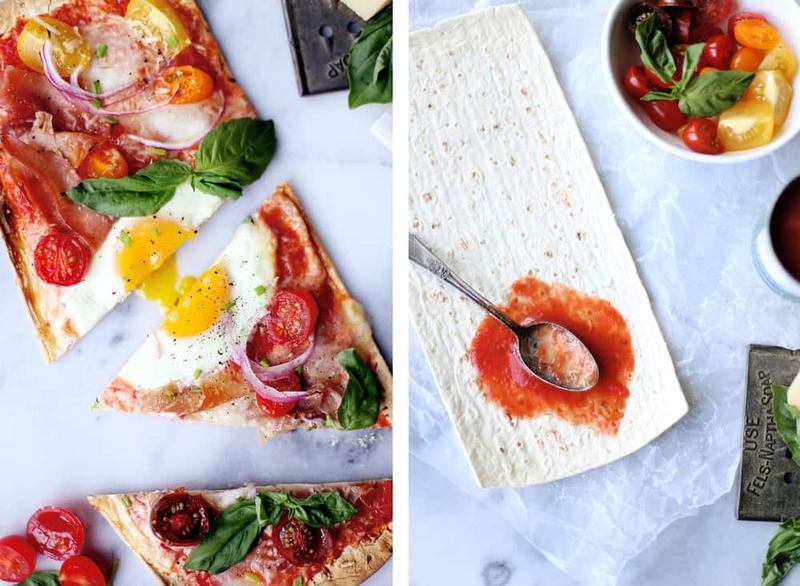 Add cheese, prosciutto, red onions, tomatoes and crack egg in the center of the pizza. Return to oven and bake until egg white is cooked. About 5-10 minutes. Top with fresh basil, salt and pepper and cut into triangles. Enjoy! 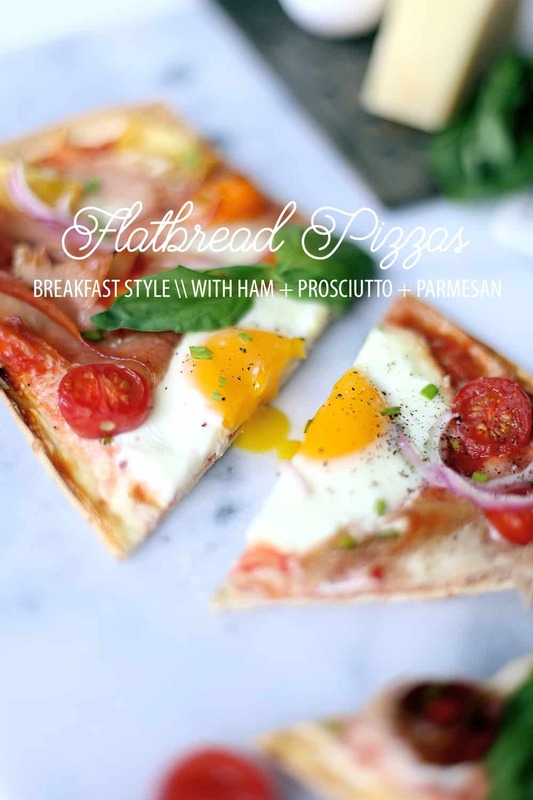 This post has been graciously sponsored by Flatout Flatbread! All the opinions expressed herein are my own. Flat out yes! This looks especially good. Thank you K-Van! I know you’ll love em!